He is well known for his oil paintings of still life scenes of fruit set against a dark background. He also painted flowers and dead game. His works were extremely popular, although little is recorded about his lifestyle. 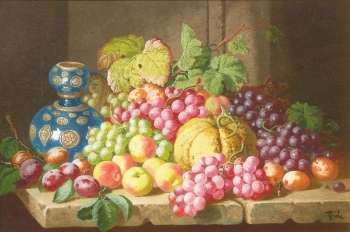 He lived and worked in London and exhibited a painting in the Royal Academy in 1872, titled "Fruit". He showed 14 works in Suffolk Street between 1868-1875, all of which depicted still life subjects except for a painting titled "The Garden Shed" in 1869. It is not recorded where he studied in his early life but his works are painted in a style derived from George Lance and William Duffield, both well known painters of still life subjects of a slightly earlier period.